Renovating a bathroom can be one of the quickest ways to add value to your house, but also one of the most stressful! We've renovated a lot of bathrooms for clients over the years and here are our top tips for keeping the costs down and making the process as easy as possible. Tiling floors in a darker tile and having white tiles on the walls always looks classy. Add some strips of feature tiles throughout and it will change the look and feel of the bathroom instantly. If you are completely ripping out everything in the bathroom to replace new, try and keep your plumbing where it is. You will save thousands of dollars if you are not moving the locations of the pipes. Once everything is stripped back to a bare frame, request a few extra noggins to your frame. It can make hanging towel rails and hooks easier at the completion of the job. Giving your old bath a face lift can save you a bucket load. Depending on the condition it may not even need to be replaced, you could just respray it for a fresh new look. If you have had any water damage in the bathroom, you may need to resheet all the walls with water resistant board before commencing. If there is any damage behind the plasterboard, be prepared for repairs to the frame, joists/bearers or floorboards. Make the shower area bigger to give your bathroom an instant appeal, everyone loves a double shower. Or perhaps a bold statement mirror is more your thing? Spend your budget on one luxury item in your bathroom to draw focus. If your bathroom is in relatively good shape and the shower and bath are good, but it might just look a bit dated, keep it simple by just replacing the vanity and installing new tapware and one of the new square showerheads. For a very small budget this can be done and will give your bathroom a new modern style. 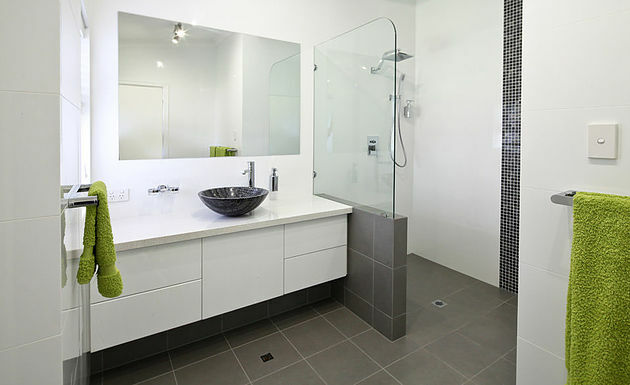 Call Mike from MJN Carpentry today to discuss your bathroom renovation, big or small - we can do it all!